I have been thinking a lot about a good and scalable development setup for small teams.That means, as team size grows, things don’t have to be changed. I am planning to have all of these one server machine (IBM) in virtualized environment. Subversion and Trac can go in one VM, perhaps under Apache. Second VM can have Apache for web-apps, third VM can have mysql, fourth VM can have MailServer and ActiveDirectory/LDAP? Do you think above makes sense? Though there should not be any restrictions on using a development IDE of choice, but I have realized if entire team uses same IDE things get far easier. The development workflow is easy, knowledge sharing and management is easy. 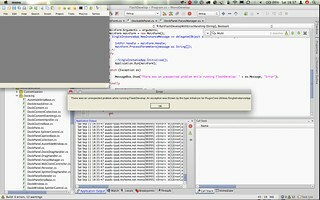 Eclipse, which Aptana is based on, can be used for variety of projects. Ubuntu is good operating system, I have been using for over one year, not regularly but quite often. There might be Windows/OSX boxes for designers. Why do we need Apache and MySQL on each workstation? I think, developers are more effective if they have their own sandbox. They can play with code freely, take certain risks and innovate. There is no harm done. We do face issues, when it comes to sync mysql data into local mysql instances, I think it can be done via some scripts. Virtualization can be done on client and I am thinking to do it, specially for folks who are not comfortable with Linux, so they can be on Windows while they also have access to Linux VM, they are encouraged to use Linux VM. They can use Windows box (Host), if something is messed up in Linux VM and there is strict timeline that doesn’t allow to fix VM. These are some thoughts, I might be missing something here. I hope, I would write more in another post. This entry was posted in General, GNU/Linux, Open Source, Web Development on June 25, 2008 by Abdul Qabiz.